Software company Atlassian saw its stock prices drop 14% on Friday a day after it announced earnings, and it has only slightly recovered since then. But with a price increase, new product and acquisition announcements, and a focus on the IT market, analysts see potential for growth next quarter. 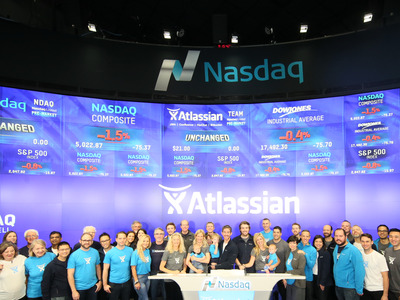 Australian team productivity software company Atlassian saw its stock drop 14% on Friday after it announced its earnings, falling from $US81.89 on Thursday evening to $US70.18 by the end of Friday. The stock has since rebounded slightly, and was trading at $US72.64 on Monday evening. Atlassian reported revenue that beat Wall Street analyst’s expectations by 3%, but the beat left some investors disappointed. Revenue: $US267.3 million. Analysts polled by Bloomberg were expecting $US260 million. Net income per diluted share: $US0.20. Wall Street forecasted $US0.19 a share. Revenue guidance (next quarter): $US287 million to $US289 million. Analysts are predicting $US281 million. Net income per diluted share guidance (next quarter): $US0.21. Wall Street was forecasting $US0.20 a share. The question going forward is whether Atlassian can penetrate the IT market, analysts say. The company has strong product demand, according to Fishbein, and just before the end of the quarter, Atlassian increased pricing for its products, meaning there’s a potential upside to the numbers next quarter. Atlassian is focused on serving the IT market. At the start of fiscal 2019, Atlassian announced its acquisition of IT alerts technology company OpsGenie for about $US295 million and introduced a new incident management platform called Jira Ops. Atlassian also just revamped Jira, its oldest and most well-known software product. The first quarter is off to a strong start so far, Fishbein says. This past year, Atlassian partnered with Slack, and one of Atlassian’s key products, Trello, saw its user base grow to over 35 million people. Atlassian also surpassed 100,000 cloud customers. Morgan Stanley analysts also believe that Atlassian has strong growth potential, as there are 100 million technical users around the world up for grabs.